This is going to be done in installments so I don't overload your brains with design goodness. Sometimes that happens to me when I look at other blogs that have amazing picture after amazing picture after amazing picture. I recently went to the Michigan Design Center along with the rest of the junior interior design class as a field trip. We went there with a focus on a project we are currently working on but I found a ton of things along the way that I loved and knew I wanted to share with my readers! 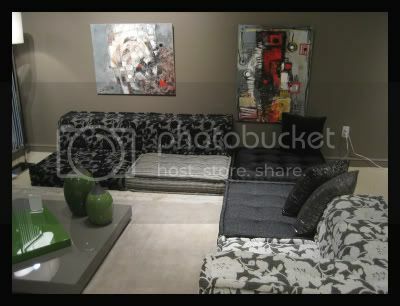 This first photo is from my favorite showroom at MDC, The Designer Group. I walked into this showroom just so overwhelmed because everywhere I turned was something amazing. My friend Jess and I were even lucky enough to meet the showroom manager and she told us a little more about some of the products. 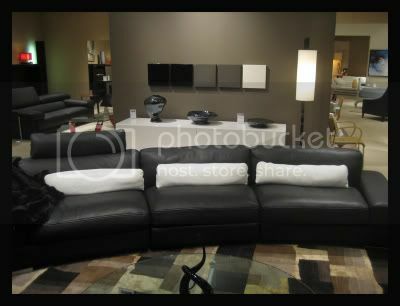 This is a sofa from Roche Bobois. I also was a huge fan of the black to white art against the gray wall in the back. 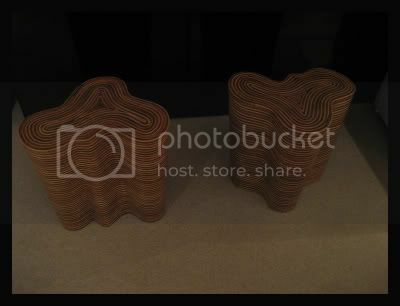 More from Roche Bobois. I think these low to the ground seating pieces are a new product of theirs. If you check out their website, you can see the variety of fabrics you can get them in and how many different looks you can achieve with these. And, more from The Designer Group! 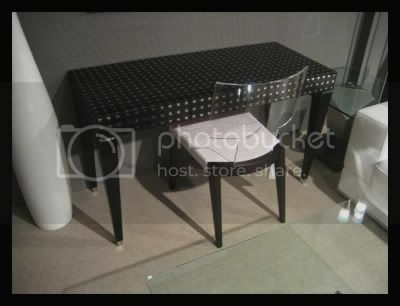 I thought this table with the little metallic squares almost looked as if it were studded. And we all know how much I enjoy studded things. And, studded things are making their way into mainstream fashion as well - check out Fashion Toast's DIY studded fringe boots here. Is anyone else noticing a pattern with black and white? 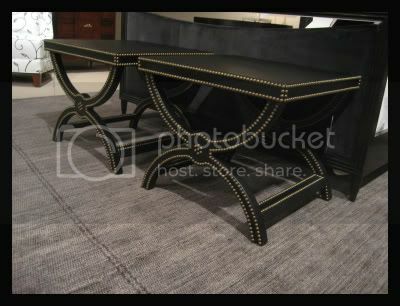 I'm starting to question whether this is a trend right now or if I just gravitated naturally towards everything black and white...hmm..
Anyways, this asymmetrical table from Roche Bobois also really caught my eye. Yay! Something from a different showroom! I found these at the Baker showroom and fell in love. Black, studded, AND leather!? SWEET! These were found at The Designer Group. The showroom manager told us something really cool about the wood these were made out of but I unfortunately can't remember what it was. I also think they may be a sustainable product. 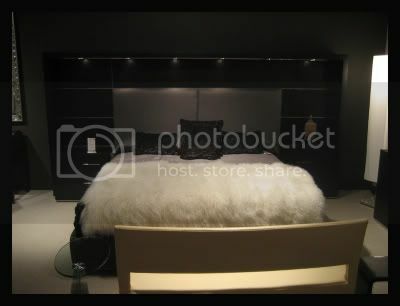 Neutral bed accented with violets at Roche Bobois. I think the purple trend is definitely starting to pass but nevertheless, this still got my attention. 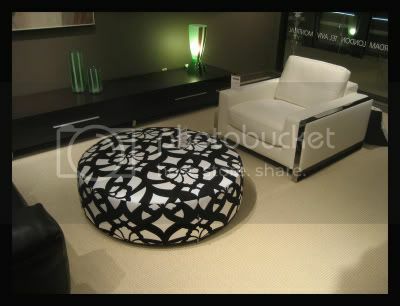 Some more Roche Bobois, Black and white accented with electric green made an appearance in their showroom on more than one occasion, and I like it! Okay! Well I think that's enough for your brains to hold right now! Make sure to stop back for Part II tomorrow! Yes! I've seen those Roche Bobois super low numbers in Dwell and they would be perfect for a client of mine who is obsessed with sitting on the floor...thanks for reminding me about them! 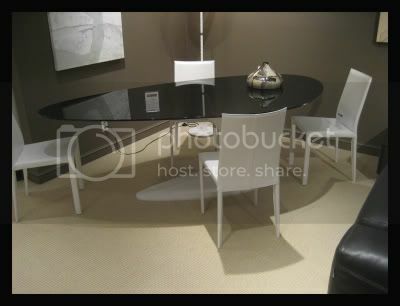 I love the clear backed lucite chair~yum!